There are some games that you’ve just gotta play with your best friend, and there are few games that embody that spirit more than Hazelight’s A Way Out. A Way Out was designed from the ground up to be enjoyed with a buddy, on a couch, and that’s just how I played it. Through twists and turns, puzzles and firefights, and many memorable moments, we worked together to overcome every obstacle before us. Though the game has its glitches and its slow points, it succeeds at being a memorable experience with a kickass final act. 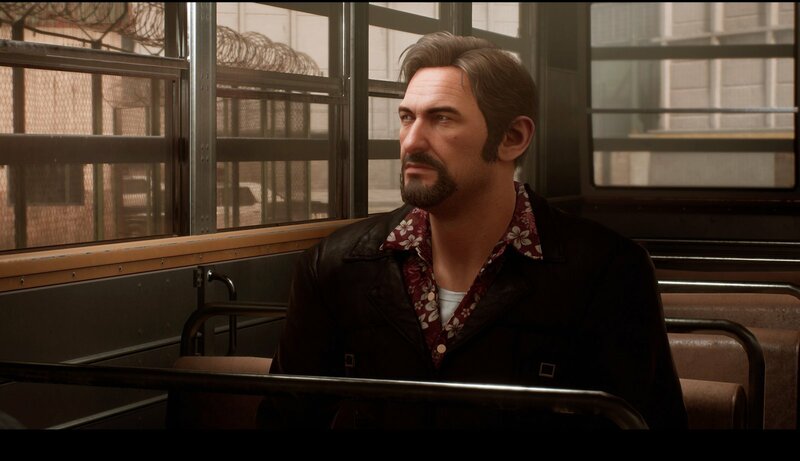 A Way Out puts you and a friend into the shoes of Leo and Vincent, two recent convicts who have been imprisoned in a maximum security penitentiary in 1972. Leo is brash, violent, and not very smart, while Vincent is calm, calculated, and new to the ways of crime. Together, you must plan and execute your escape, and seek revenge on the forces that had you imprisoned in the first place. The two protagonists’ differing personalities will affect the story, depending on which player decides to do what. For example, if one player needs to get through a locked window, they will solve the problem in different ways depending on their selected character. While Vincent will find a way to jimmy the lock and get through discreetly, Leo will simply smash the glass and get through. Leo’s methods are usually more straightforward and faster, but often lead to some of the game’s more chaotic version of events, while Vincent’s methods are more calculated and more strategic, but often take much longer to execute. The story in A Way Out centers on the bond that forms between Leo and Vincent as they learn to trust and rely upon one another in increasingly more dangerous and difficult situations. It’s a simple narrative about two men trying to right the wrongs in their life, but the game’s protagonists are interesting enough to keep you invested along the way. With such a solid story and interesting characters though, it’s a shame that the dialogue is often very weak. Leo and Vincent often repeat themselves, engage in cringeworthy banter, and have a lot of conversations that end up going nowhere. For example, this is the only game I’ve ever played where the characters say, “It is what it is,” on multiple occasions as a means of ending a conversation. Even when the somewhat inconsistent voice performances are at their best, it only occasionally makes up for dialogue that could have been so much better considering how strong the narrative and characters are. In A Way Out, you’ll spend your time working together with your co-op partner to solve puzzles, defeat enemies, and accomplish incrementally more difficult goals in your quest for freedom. Most sections have you overcoming simple puzzles through cooperation, though there are also quicktime event-based combat sequences, some shoot ‘em up parts, and even some getaway sequences. Adding further flavor to the experience are minigames hidden throughout the game, which offer a highly amusing distraction from the more meaningful objectives that are thrown at you. Not every section succeeds at being totally entertaining on its own (the shooting sequences, for example, are extremely simple and become dull after a short time), but none of them last long enough to become irksome and the game succeeds as a whole through sheer variety alone. A Way Out starts off really strong, with interesting puzzles centered around breaking out of prison. Working together to complete small tasks all aimed towards a clear goal is exhilarating, especially while the relationship between the two protagonists is still developing at its earliest stages. Unfortunately, the game enters a bit of a prolonged lull during the middle acts of the game where the goal is less clear, and some sections can feel a bit like filler. However, all of that is redeemed by one of the strongest final acts I’ve played in a long time, and totally makes up for any and all slow sections. I won’t be going into the finale to avoid spoilers, but suffice it to say that it’s a payoff that’s well worth the game’s $30 asking price and 5-6 hour playtime. The presentation in A Way Out is mostly impressive, especially for a title coming from such a small development team. I played on the Xbox One X, and visually, the game often looks really good, especially outdoor environments and during action sequences. However, I encountered quite a few graphical issues, including assets popping in and out, and characters sliding into place when a cutscene was triggered, but rarely were these issues every immersion-breaking. A Way Out’s soundtrack is very good, featuring pulse-pounding action music, emotional melodies, and more. The voice acting is more of a mixed bag. Though the most important performances are usually pretty good (despite the weak dialogue they’re working with), secondary and tertiary characters aren’t always as consistent.